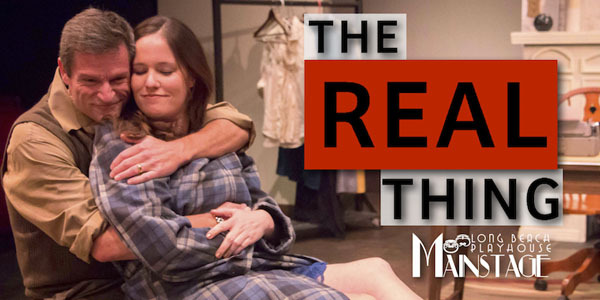 Mostly well done, Tom Stoppard's The Real Thing, directed by Sean Gray for the Long Beach Playhouse Mainstage Theatre, recounts the story of Henry (Noah Wagner), a brilliant and celebrated playwright. Successful, highly regarded, he is to the articulation of words and integrity of ideas as another Henry, Henry Higgins, is to proper pronunciation and good grammar. Though he's high-minded, he's not high browed. He prefers pop to classical music. He does believe, though, in the sanctity of words. That's all in his head, though. His real life is a mess. The story features characters that seek the real thing that is love. This it does through an examination of the affair that Henry conducts with Annie (Loren McJannett-Taylor), an actress married to Max (Sean Hesketh). In a play within a play written by Henry, Max co-stars in a play with Henry's wife Charlotte (Louisa Dienst). Max's character is devastated to learn that Charlotte's character is having an affair. Offering a nice bit of foreshadowing, the scene echoes what later happens to Henry, when he discovers evidence that suggests that his now-wife Annie is having an affair with her colleague Billy (Wilhelm Peters). It also shows poor Max getting cuckolded twice, once on the stage, once in real life. Henry's an interesting and complex character. Not only does he write plays about the vagaries of love, he enacts them in his offstage life. To his credit, Wagner makes his Henry sincere and believable. His character feels deeply about love's giddiness and despair. Though Henry insists on craft, he also insists on integrity, at least until he has to write for TV. When Annie asks him to ghostwrite the memoir of Brodie (Anthony Nash), a soldier arrested for burning the wreath on the Tomb of the Unknown Soldier, he's as much concerned for the man's motivation as he is for the fact that the guy can't write. The production's most compelling moments are when the otherwise venerable Henry shows his vulnerable side. When he admits how hard it is to find true love, much less write about it. When Annie betrays him. When Brodie is released from prison and scolds Henry for his TV hackwork. And when he tells Debbie (Amara Phelps), the daughter he had by Charlotte, that her clever words on the obsolescence of monogamy are just that, clever words. Though the characterizations ring true, the connection between Wagner's Noah and McJannett-Taylor's Annie lacks conviction. Because words are Henry's (and Stoppard's) currency, it's dialogue that makes the play funny, sad, and insightful. Because a couple of the British accents are not a little contrived, scenes are sharp but they aren't scintillating. There's no final word here on the nature of love. Is it something enduring and romantic? Is more of a business relationship, subject to negotiations? As a provisional solution, the production suggests, as Fats Waller once sang, "if that isn't love, it'll have to do, until the real thing comes along." Performances are 8pm, Friday and Saturday and 2pm, Sunday. The play runs until March 28. Tickets are $14 - $24. The Playhouse is located at 5021 E. Anaheim Street, Long Beach, CA 90802. For more information call (562) 494-1014, option 1 or visit www.lbplayhouse.org.